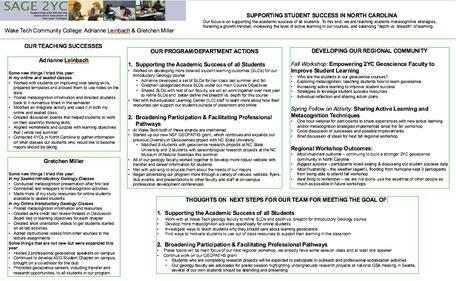 Our focus is on supporting the academic success of all students. To this end, we are teaching students metacognitive strategies, fostering a growth mindset, increasing the level of active learning in our courses, and balancing "depth vs. breadth" of learning. In addition, we are working to broaden participation and facilitate professional pathways in geoscience through local partnerships that allow our students to participate in authentic research experiences, mentoring, and professional socialization. As of June 2017, we have been supporting the academic success of all students by introducing metacognitive strategies such as test wrappers and presentations on learning strategies, and utilizing more active learning techniques with in-class activities and more interactive discussion board activities for our online students. All of our geology faculty members are also involved in a project using backwards design to align our student learning objectives, activities, and assessments in our Introductory Geology course. We are broadening participation and facilitating professional pathways in geoscience by partnering with North Carolina State University (NC State) and the North Carolina Museum of Natural Sciences (NCMNS), who provide our students with paid summer research experiences and mentoring. The students who completed research projects have been provided additional opportunities present their research and serve as mentors to potential new students in the program (link to GEOPATHS Project Description). As of June 2018, all seven of our geology faculty members have completed the first step of backwards design by developing a set of topic specific student learning objectives (SLOs) for our Introductory Geology course, with plans to align our activities and assessments over the next year. All of the faculty members have also reported making individual changes in their classes as a result of the professional development activities we have provided through the SAGE 2YC project. We are utilizing the data we have been collecting to guide our continued efforts to implement metacognition and active learning strategies. We are continuing to broaden participation and facilitate professional pathways in geoscience by working with our partners at NC State and NCMNS. In Summer 2017, 10 Wake Tech students completed and presented research projects with our partners, and 4 of those students additionally presented their research at the October 2017 Geological Society of America (GSA) national meeting. In Summer 2018, we have 11 Wake Tech students working on research projects with our partners. We have also increased advertising our program through a variety of venues including the college website, flyers, and Geology Club events. We plan to continue working on backwards design by aligning our activities and assessments in Introductory Geology with the SLOs we have developed. Based on data showing a lower success rate in our online classes, we also plan to develop some focused communication interventions with our online students very early in the semester with targeted support. We will also work on improving their time management skills. We are planning to write scientist spotlights based on our geology faculty, and request that former students that have completed our research program write spotlights on themselves that we can share. We will use the spotlights in our classes and for advertising around campus and at special events. We will continue working with our partners at NC State and NCMNS to provide research projects to our students until the end of 2019 when our grant funding ends. We plan to investigate funding options beyond 2019, possibly expanding these opportunities to other 2YC students around the state. We will also investigate other potential partnerships and research opportunities for our students. Adrianne teaches introductory geology in all modes seated, online and hybrid. She has been at Wake Tech since 1999 and teaching online since 2002. She works with other geology Wake Tech faculty on a GEOpaths grant which allows students from Wake Tech to participate in research at NC State and our local museum. Adrianne also serves on several committees who work to improve online learning by both focusing on student readiness and faculty knowledge specific to online teaching. She is always interested in improving student success and will try new things in both her seated and online classes. Adrianne teaches Intro Physical Geology (online). 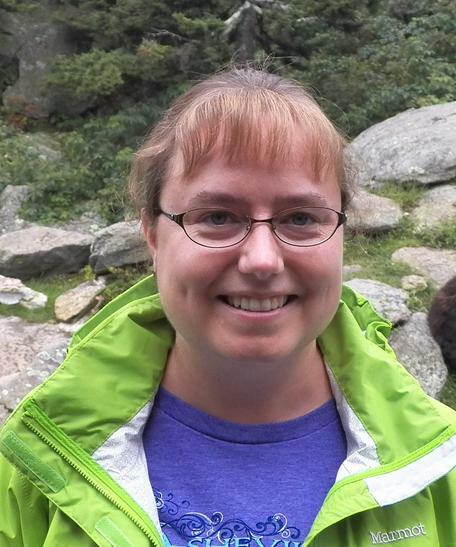 Gretchen is a Professor and served as the Geology Lead at Wake Tech from 2014 to 2016. She and Adrianne have developed a collaborative working relationship with faculty at North Carolina State University to increase the number and diversity of students pursuing geoscience degrees. Prior to teaching, she was a hydrogeologist at an environmental consulting firm and is a North Carolina Licensed Geologist. Gretchen teaches face-to-face Intro Physical Geology and Environmental Geology (lecture and lab for both) as well as online sections of Intro Physical Geology (lecture and lab). Institution: Wake Tech is the largest two-year college in North Carolina. It has over 70,000 students - 56% of whom are women and 24% of whom are African American or Black. Wake Tech serves the greater Raleigh, NC region in Wake County from five campuses and other sites. Geoscience program: The geoscience program at Wake Tech is made up of 7 full-time faculty. It offers courses in Physical, Historical, and Environmental Geology. Intro Physical Geology and Environmental Geology are both offered as face-to-face and fully online courses. The Geology program is part of the Department of Natural Sciences at Wake Tech, which also includes Biology and Chemistry. The Department of Natural Sciences is in the Mathematics, Sciences, and Engineering Division at Wake Tech. Approximately 1,300 students per year complete Intro Physical Geology at Wake Tech. The majority of these students are college transfer students intending to transfer to a four-year college and take the course to meet their science requirements. Enrollment in the course is very diverse, more than 25% identify themselves as belonging to minority groups. A few students each semester will decide to major in geoscience after taking the course. Intro Physical Geology is a prerequisite for Historical Geology and Environmental Geology; approximately 40 students per year take each of these courses. Institutional demographic data is from IPEDS, the Integrated Postsecondary Education Data System, U.S. Department of Education, typically for the 2014-15 year as available.